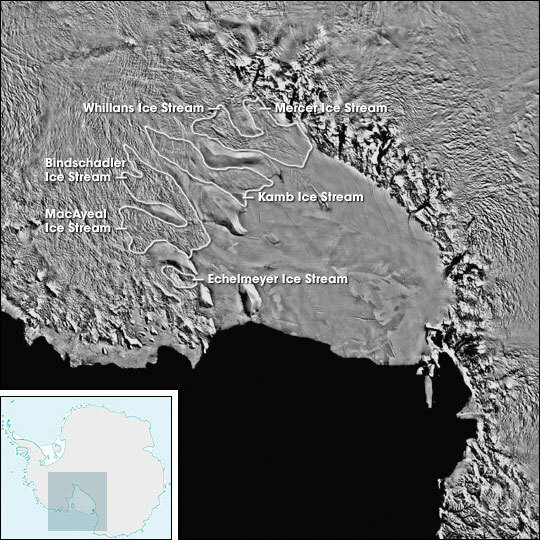 WHILLANS ICE STREAM, ANTARCTICA– There are two basic projects that we are working on through our field work in Antarctica. One is looking at changes in the ice surface motion through time. To do this we make three types of GPS measurement: 1) continuous stations which measures a position every 10 to 30 seconds; 2) repeated measurements of poles stuck in the ice surface. 3) Kinematic lines (GPS is affixed to a snowmobile and we drive it around). 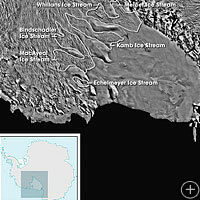 The last technique does not give us velocity information, but the topography of the ice sheet. See us installing a new GPS station in the video below. We previously assembled the tower, which contains solar panels and wind turbines, to charge the batteries. The batteries and the GPS hardware are in the gray cases. We use towers to keep the solar panels from being buried by accumulation and drifting snow. Note the old station in the foreground and how close it is to the snow surface. This video is played back at 15x speed. We always have a handheld GPS on while we’re driving our snowmobiles, just in case we get lost or conditions change and we can’t see. This way we can know where we have gone and were safety lies. I compiled all of our GPS tracks and made this map. This map our snowmobile tracks. 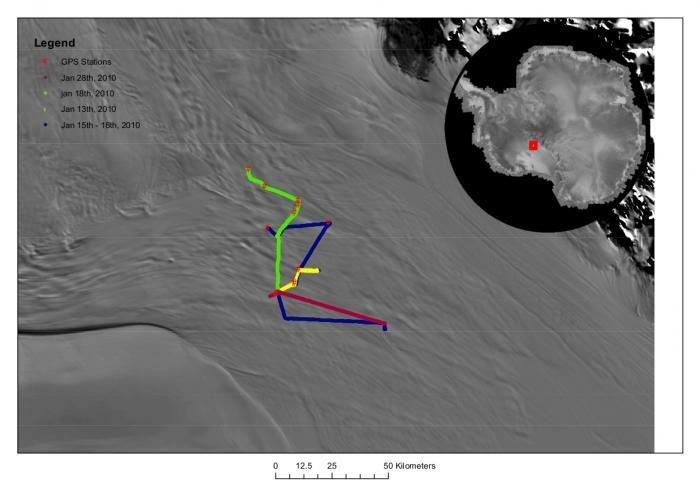 We have ten GPS station around the ice sheet, plus a few other locations of interest (seismic instrumentation or flag pole to re-measure) which we visited at least once each during our field season. I drove over 400 km during our 4 week field season. Here we measure a flag pole to see how much it has moved since we measured it last (the year previous, in this case). Some times the flags were frozen into the ice and we couldn’t get them out. 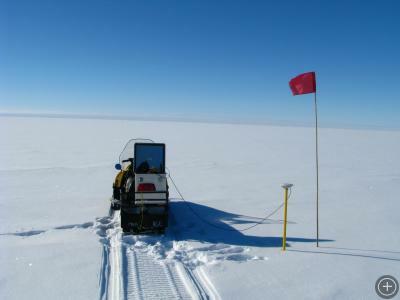 As a result we measure a location next to the flag and make careful notes about how far away our antenna is. 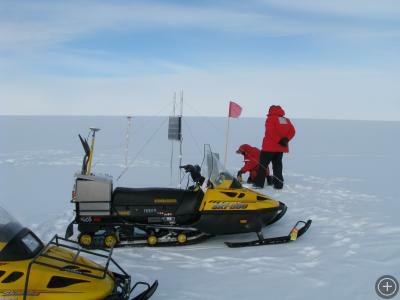 A snowmobile outfitted with a kinematic set up: simply a GPS antenna strapped to the side. We’re not moving in this picture, but are we record positions whenever we drive around. 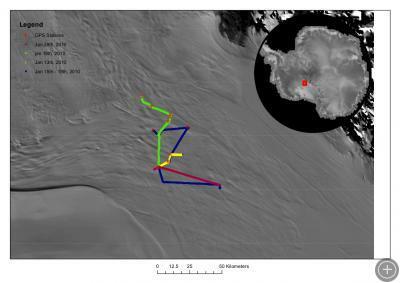 We can use this kinematic set up to measure surface elevation and if we have multiple measurements, as in the image below, we can see changes in the ice surface topography. 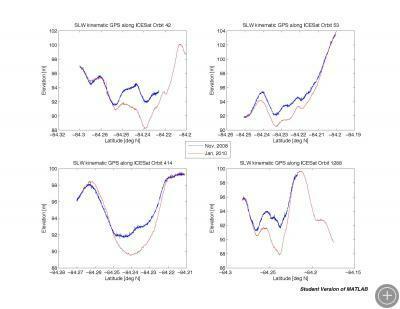 In this image four kinematics GPS profiles are shown and the elevation differences between the two time periods are different. We can see that the surface of the glacier is changing rapidly. The reason for these changes are that highly pressurized water is creating a cavity below the glacier which floats the ice up. These cavities can also drain allowing the surface to deflate. 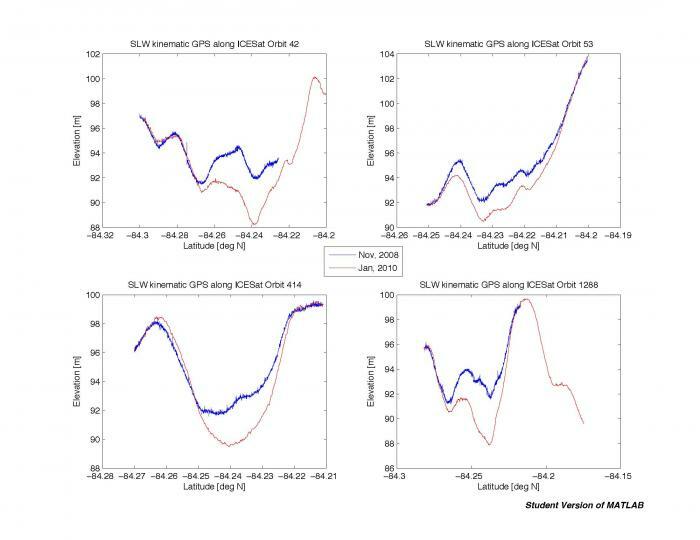 Lucas Beem studies the motion of ice through the use of GPS (Global Positioning System), modeling and other remote sensing instruments, including ICESat and ASTER. He is a PhD student at the University of California at Santa Cruz and is interested in unraveling the mysteries of how the conditions at the bed control the the motion of ice above it.